VWO recently conducted a giveaway along with Concept Feedback where we promised a free website evaluation by a Concept Feedback expert. Charmingcharlie.com won this contest and Concept Feedback expert Tom Charde along with the team has been working hard to churn out a brilliant review for this website. Read on for a review of CharmingCharlie.com, head to tail. 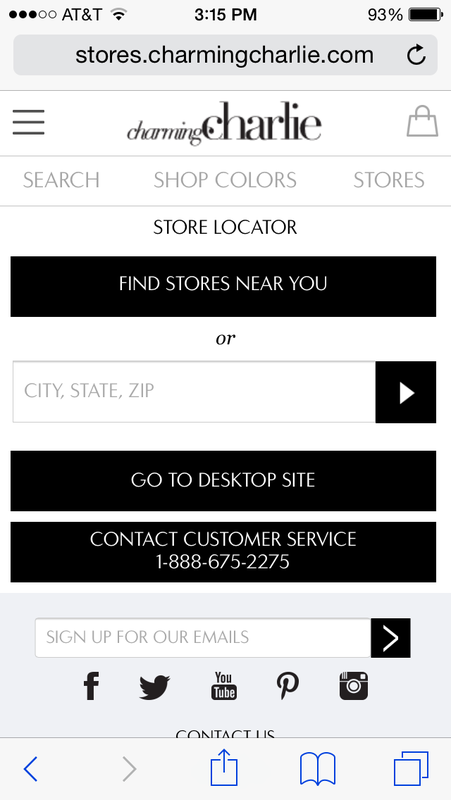 Mobile – iPhone 5S | iOS (8.3) | Safari browser. After a quick walkthrough of the website, a couple things are very clear: it has a very clean design, is aesthetically appealing, has an audience-appropriate tone, and provides an impressive product offering. 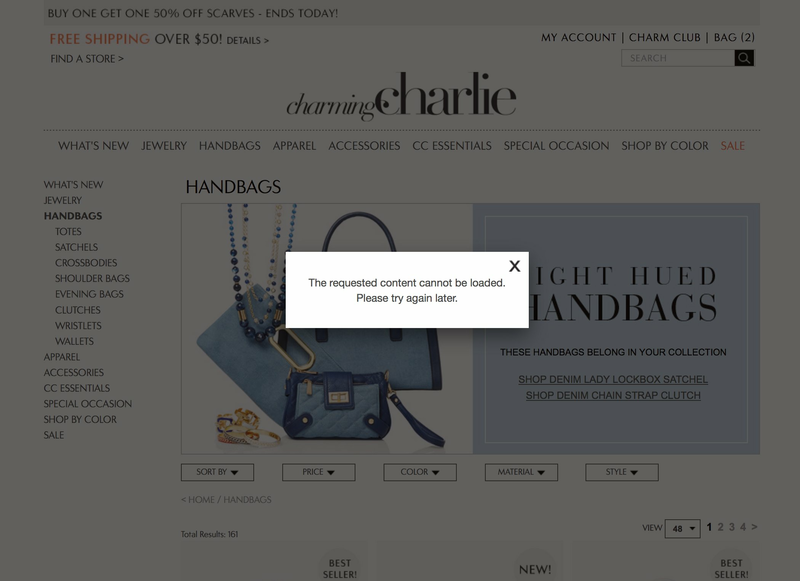 Charming Charlie steers clear of excessively large images and in-your-face promotional messages, which, in itself, is a big win for the user experience. The first big hurdle that we noticed upon visiting the site is that it lacks any kind of site description, positioning statement, brand promise and/or value proposition. Your existing customers may know all about you, but there’s a large, untapped audience you’re overlooking: people who are unfamiliar with your brand. How would you describe the company to someone who’s never heard of it? How does it provide value to its customers? What differentiates it from the rest of the market? Here’s what we can make out from a simple research of the brand; Charming Charlie is a retail store (online and offline) with the latest trends in women’s apparel, fashion jewellery, shoes, handbags, accessories and more. This should ideally be mentioned on the home page and done so in text format. 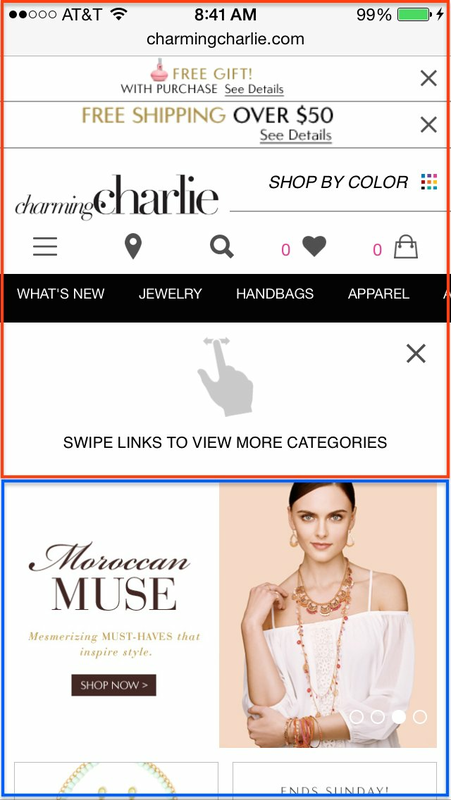 There are several great copy points on the ‘About’ page that could ideally craft the messaging and help establish a unique tone for Charming Charlie. We thrive on making a statement. We know accessories have the power to transform both your outfit and your outlook. Helping every woman, everywhere, find her fabulous. If it feels good, do it. If it looks good, do it in every color. Bring out your most fabulous, fierce and fun self. Refining the messaging will not only strengthen the brand, but will also boost the search engine rankings for relevant keywords. Moving forth we will break our analysis down to 3 categories; Technical analysis, Heuristic analysis and Mobile website analysis. 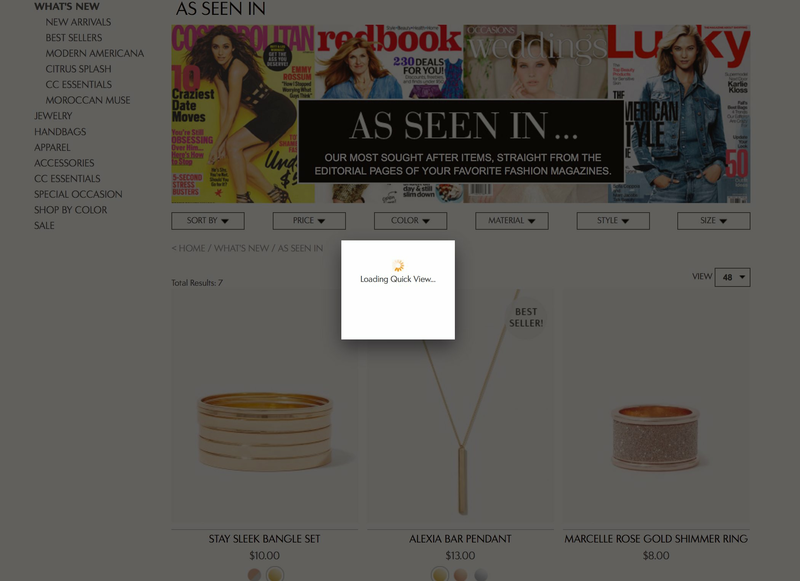 Upon arriving, the site immediately forces an intrusive promotional pop-up on the user. We’d recommend running a few tests on this (one without any pop-ups; one with a 15-sec delay; etc) to see if the bounce rate improves. The top promo banner in the header (scarves) is loading an error message. The “Quick Views” feature on the “As Seen In” page doesn’t seem to be working; it displays an endless loading spinner. Many of the text-based graphics throughout the site aren’t retina-ready. (Examples: Charming Charlie logo, media logos in footer, free shipping banner.) Most users won’t experience a difference, but those with retina displays are seeing a pronounced drop in graphic quality. The email sign-up page (under “Customer Service”) gives an “invalid certificate” error. Testing this on Mercury Browser also showed similar results. 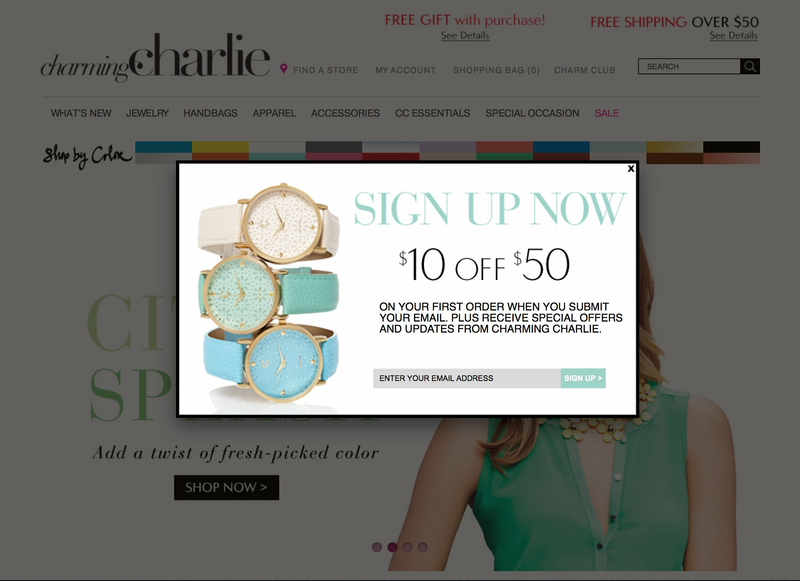 CharmingCharlie.com’s clean, minimalistic design is one of its major strengths. It sets the tone right away. The homepage’s look and feel is right on target. Design-wise, one thing we’d suggest is tweaking the styling (inconsistent text colors and alignment) and placement (perhaps move to hero image area?) of the promo banners, which seem to jumble up the header space. The area of the homepage with the most room for improvement is the content. Allocation of page real estate: The current viewport is dominated by a giant slider; an area that can be used much more efficiently. Try reducing the height of the slider images, moving some of the featured products and messages up, and testing for engagement. Complete absence of copy: There is literally zero copy as HTML text; the entire page is image-based. In addition to accessibility issues and increased page load time, lacking text on the homepage is killing the chances of achieving a decent search engine ranking. Lack of Clarity around Newsletter sign up form: There is a “Sign up for emails” form in the footer, but there’s no information about what this is for. Think about it from a user’s perspective: “Why should I sign up? What are you going to send me in exchange for giving my personal contact information?” Try adding a brief description near the form or a link which describes what a user can look forward to. Following is a screenshot of homepage, annotated with things that should be worked upon. We’ve also made a quick mockup for one possible way the header might be transformed. The What’s New category is confusing. It has a combination of “themed” content (Modern Americana, Citrus Splash, Moroccan Muse). 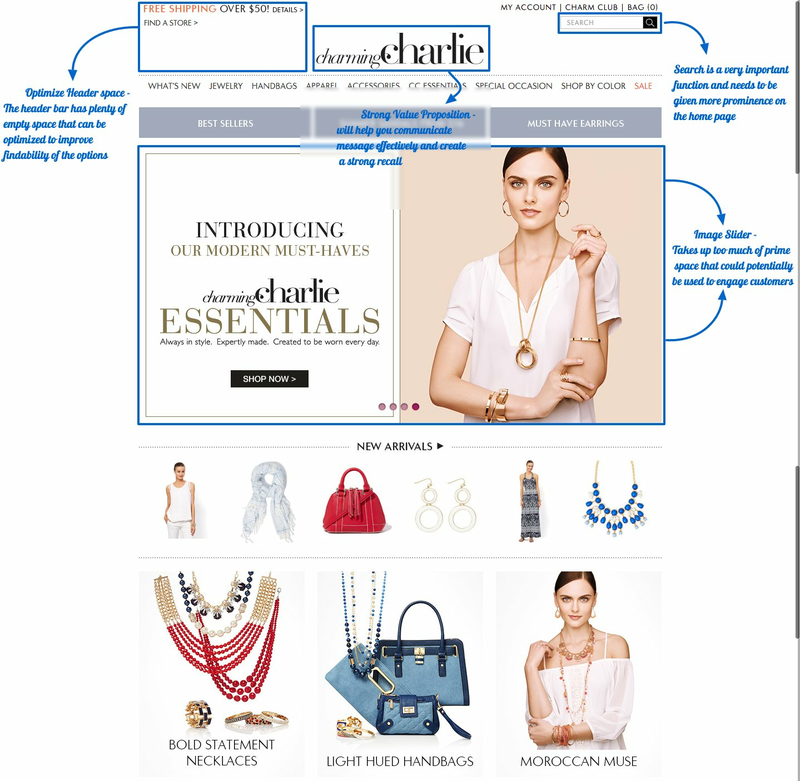 A redirect to an existing main category (CC Essentials). An out-of-place sub-category (Best Sellers). There’s really only one true subcategory that fits here: New Arrivals. To remedy this, simply eliminate the What’s New category entirely by ‘New Arrivals’. 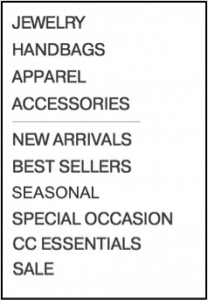 Following is a screenshot of the category browsing drop down of Charming Charlie and things that should be worked upon. Also consider sorting the resulting list of categories into two grouped areas: those which are a product type (Jewellery, Handbags, Apparel, Accessories) and then all the others (New Arrivals, Best Sellers, Seasonal, Special Occasion, CC Essentials, Sale). And it may help to separate the two groups in the side nav with a faint line. Check the mockup with these suggestions implemented. The product page looks pretty standard but there are multiple tweaks which can be done to make them convert more. The screenshot below annotates some aspects which can be improved. One other glaring aspect which we noticed was that there is no product review system. 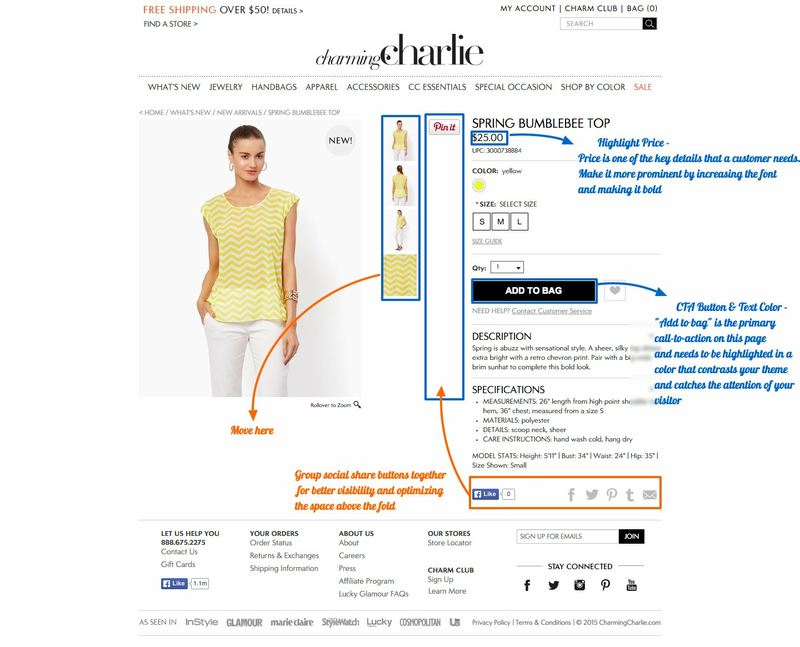 It often acts as a social proof and really helps the visitor take a decision on the product page. Similar to the desktop site, the mobile version of the homepage suffers from a serious page real estate concern: the promo messages, navigation, utilities, etc take up almost 60% of the initial screen. Reducing the size of this footprint and moving the meat of the content up will almost certainly improve bounce rate and conversions. With two form fields (styled differently for some reason) interspersed among three large, black buttons — the eye just doesn’t know where to go on this page. Converting the buttons to links, and adding some space between the main content and the footer (email signup form) should help create a better flow. We would recommend increasing the font size of the product page body copy. The size used on the About, Privacy, and other non-product pages is much easier to read — as can be seen below in a side-by-side comparison. 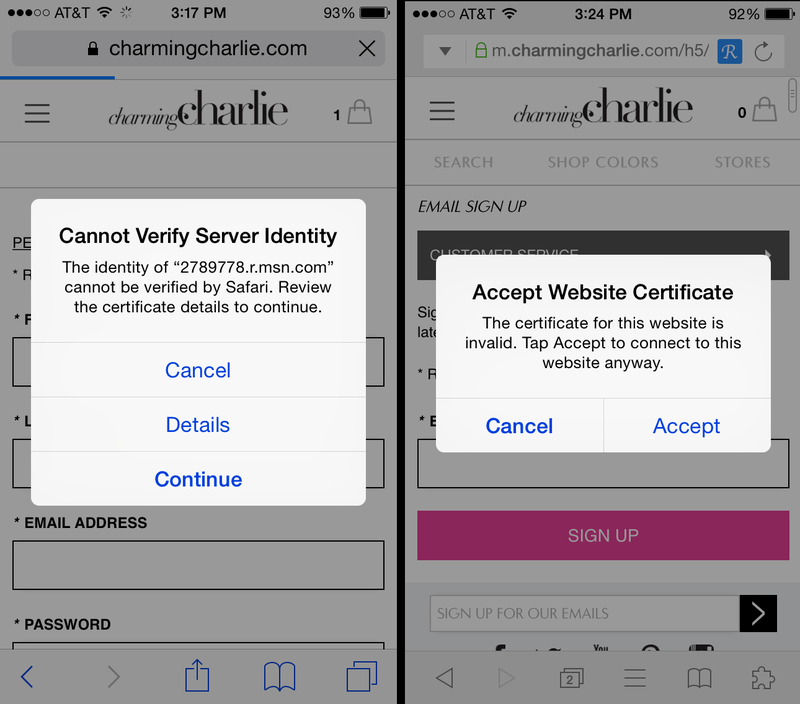 This brings us to the end of the website review of Charmingcharlie.com. 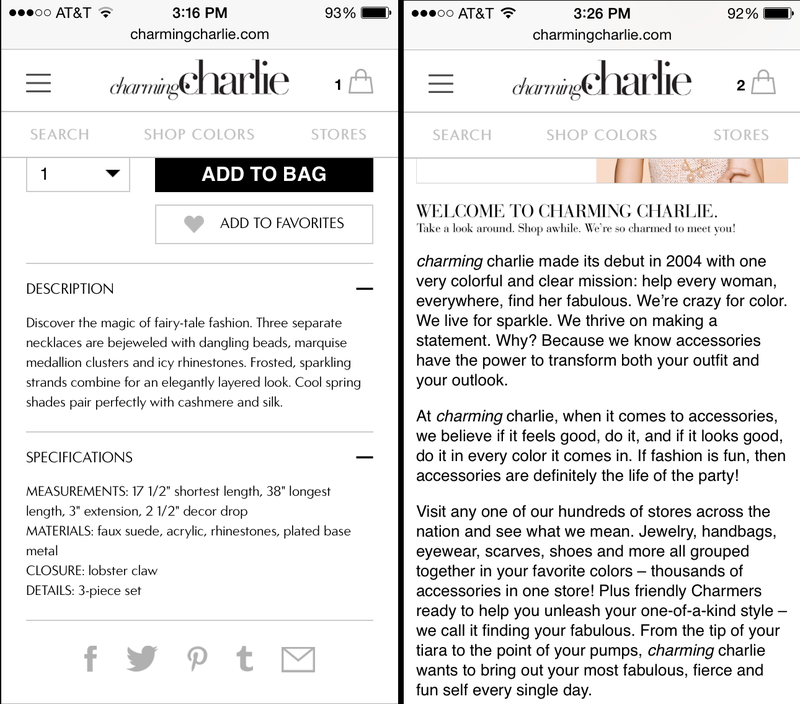 We definitely hope Charming Charlie would implement these changes and share the results with us. We thank Tom Charde for working rigorously on this review and helping us in bringing this review to such good shape. We are going to conduct another giveaway very soon; Can’t wait for the giveaway? You can head to Concept Feedback and hire expert services to get your website reviewed in detail.